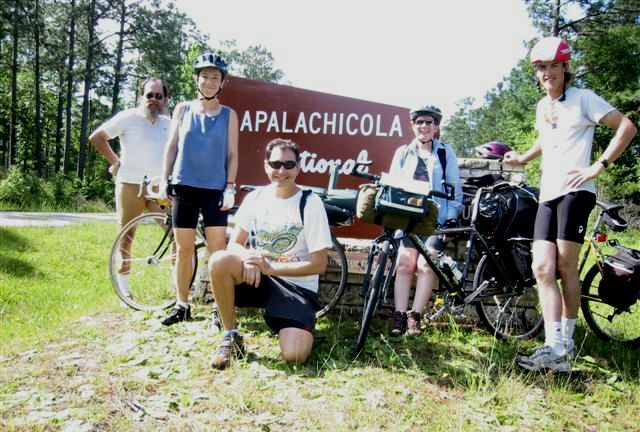 In late April 2003 I got email from Leigh inviting me to join the Tour de Apalachicola -- a small group planning to circle the Apalachicola River in three days. The Apalachicola River starts with the confluence of the Flint and Chattahoochee rivers in Lake Seminole at the Florida - Georgia - Alabama corner. Five bridges cross it. The US90 bridge is less than a mile from the dam that forms the lake. The railroad and I-10 bridges a short way south are not accessible to bicycles. The SR20 bridge between Bristol and Blountstown is about 1/3 of the way down. From there, the next bridge is the US98 bridge that crosses the outlet at the town of Apalachicola. So for all practical purposes you really do go all the way around the river if you cross it on US90 and US98. As the date approached, I remained self-unemployed and decided to give myself that Friday off. I finally got my BOB Yak trailer hooked up and working. I threw together too much gear and drove out to Bristol bright and early on May 9, 2003. Shortly we had the group together: me, Leigh, Nick and Patsy (Leigh's colleagues at The Nature Conservancy), and Jim (another friend of Leigh's). We rolled south from Bristol and soon into the Apalachicola National Forest. It did not take me long to notice the heat. OK, I've lived in Florida all my life and I know about the heat. Somehow I had convinced myself that early May, though hot, would be dry enough to make the heat bearable. I learned differently. Still, we saw some neat things. The first day we saw several swallowtail kites, and the road wound past numerous patches of Spiranthes (a native orchid), pitcher plants of several varieties, a couple of Meadow Beauty (a Rhexia species), Calopogon (another native orchid), blue flag irises, stands of dwarf cypress, and the impressive open savannahs along CR379 (designated a USFS Scenic Byway). Despite many areas of planted pines, some of this area has survived the worst ravages of forest management -- partly because the poor soil doesn't grow happy trees in a hurry, and partly because of outcry over a number of rare and endangered species found here. At about the halfway point for the first day, we stopped at the store in Sumatra. This tiny town is one of the most remote in Florida. By now I was really hot but still determined. The determination got me far enough along the next stretch that the campground at Eastpoint was closer then turning back -- past the point of no return. 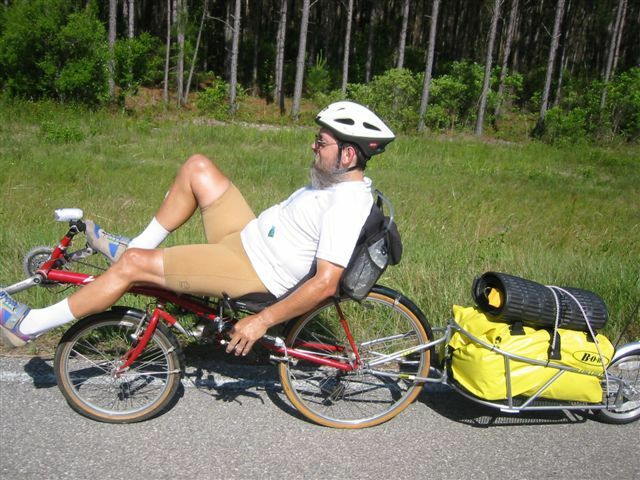 I was always the slowest rider in the group -- no surprise -- but also the steadiest, in large part because on my recumbent I got more rest while coasting. Not that there were any hills. For some 85 miles -- from Sumatra on the east side of the river to Wewahitchka on the west side -- the only noticeable elevation change of any sort was at the bridges at Apalachicola and crossing the Intracoastal Waterway north of Port St Joe. Another 20 miles north of Sumatra had only tiny elevation changes, things I sort of notice on a bicycle but never in a car. But I could take a few pedal strokes, relax, enjoy the breeze, stretch, repeat to camp. Nick and Patsy were far ahead. I was playing leapfrog with Leigh and Jim for a while, then I didn't see them. The closer we came to the coast, the flatter the swamp, and the more boring the road. Either the flowers thinned out or I was too hot and tired to see them. The road (SR65) is dead straight for miles. Near the end, it turns and parallels the coast for nearly ten miles, I emptied my water bag for the second time -- a total of five liters -- and stopped to refill it from bottles. Then a turn. I was about three miles from the coast, but the road was so straight that I could see that the next turn would be onto the coastal highway (US98). When I made the turn, my heart sank again when I saw the St George Island bridge far away, knowing that I had to go past it to get to the campground. I made it. Stopped paying attention just before I reached it, and when it surprised me, I fell right over onto the shoulder. On the dirt luckily. When I finally hauled myself into the campground, the next surprise was that Nick and Patsy weren't there! I had just determined this when they turned in, fresh from consuming a beer in Eastpoint. So the turtle arrived first, 63 miles for the first day. The campground was full of RVs, but quiet since they had full hookups. We only wished to have arrived a bit sooner to take advantage of the pool. Well, it was quiet except for the dog that howled all night. Looked like the campground dog -- wandered all around the campground howling mournfully. I figured at least it kept the raccoons away from our food. I'd drunk about six liters of water on the way. That and some food must have waited unabsorbed in my gut, because during the night the water started passing through me and my blood sugar went way up. I still haven't figured out this phenomenon. (Late flash: my doctor says that these conditions -- heavy exercise and heat stress -- can cause some temporary gastroparesis. Not a danger because the stomach absorbs all the water you need directly. I suspect this is what happened.) Also, my pulse was about 100 when I went to sleep -- four hours after last exercising -- and didn't drop below 85 all night. My doctor says this is nothing to worry about under the circumstances. In the morning we took our time and then rode the six miles to Apalachicola (across the bridge) for breakfast. We were surprised to find the normal eating places closed on Saturday morning, despite the rapidly growing importance of the tourist trade there. We finally found the Red Top open. We ate well, though like on the entire tour, none of us were particularly hungry. From Apalachicola, there's a choice: a boring flat straight route through swamp mostly planted in small pines, or a considerably more scenic route along the coast. Unfortunately the scenic route is several miles longer, and I decided I didn't have the energy for it. As it turned out, only Patsy elected that route. We regrouped in front of the Constitution Convention Museum, commemorating the development of Florida's state constitution in 1838 (http://www.dep.state.fl.us/parks/district1/constitution/index.asp). One Robert Raymond Reid, commemorated along with the others on a plaque here, chaired the convention. I have three relatives with exactly the same name, but no one has ever been able to discover whether we are related to Governor Reid (as he was a couple of years later before dying in one of the yellow fever epidemics). We cooled off while eating lunch in a very pleasant cafe in Port St Joe. We rolled north out of Port St Joe onto a stretch of road even more isolated than we saw the day before (SR71). This road heads north out of Port St Joe. Ten miles later it hasn't bent. At this point it bridges the Intracoastal Waterway and passes the small, optimistically named town of White City. Three miles later it bends once more and then goes straight for another ten miles or so. The shoulders are wide, and getting into shade almost impossible. I was surprised to find that this road is actually even more boring on a bicycle than in a car -- I hadn't thought it possible. But it was. I had to tell myself just keep going, take a few pedal strokes, relax, repeat ... I literally did not put my feet on the ground for the 25 miles from Port St Joe to Wewahitchka. There wasn't any place I wanted to stop, and if I'd found a place I wanted to stop, I wouldn't have started again for quite a while. I almost had to stop once -- going up the bridge at 4 mph, my sweat was running into my eyes, but I kept it just clear enough to go on. B hot O hot R hot I hot N hot G ride. But at least with a wide smooth paved shoulder. Finally I passed a house with a tent out front and a sign "HOT BOILED PNUTS & SODA". Coming back to civilization of a sort. Passed Gaskins Still Road -- I wonder how many people have gone down that road just because of the name. The small town of Honeyville is just an outskirt of Wewahitchka, and soon I was in town. But where were the other bikes? I knew they were ahead of me, and we'd talked about eating here (though I could not believe anyone would be hungry yet). But no bikes. Very soon I was outside Wewa on the north. I actually found a good shade tree and stopped to rest -- and to make phone calls, since I figured there would be no cell signal at our remote campground that night (later proven correct). So did they cut short their stop in Wewa and go on, or did I miss them? I could not recall a specific meeting point in Wewa (this remained a split opinion in the group later), so I went with the most basic choice: I headed for camp. And I found another surprise. Hills. Not big ones, but some elevation change, even significant at times. I had driven this road a very times and didn't remember this. But here they were, and this would have been a very pleasant ride without the heat. I knew we were planning to camp at Scotts Ferry, but had been wondering what the ferry was all about. Somehow it had slipped my mind that the Chipola River has become very large at this point, just before it feeds into Dead Lakes and then the Apalachicola River. In my mind, the Chipola River is the clear water flow which near Marianna is hardly more than a very large stream. But when I crossed it on my bike, it was very clearly a major river. So I pulled up at the general store, which also serves as the campground office. Ms Early, one of the owners, hadn't seen any other bicycles today. Hmm! So maybe they are right behind me? I talked with Ms Early for a while and finally decided I'd best go ahead and set up camp and wait -- after all, no matter what the others were doing, I wasn't going anywhere else tonight. 67 miles for the second day. This campground had a few mosquitoes, but only a very few. Even this was the most we'd seen the whole weekend. Must be the recent lack of rain. This place looks like a mosquito jungle, but in fact it was quite pleasant. The campground is right on the river (it obviously floods on a regular basis). The only downside is the condition of the restrooms: no lights in the men's room, no windows anywhere, and the plumbing had backed up by the time we left in the morning. Cost us three times as much as in Eastpoint! But we had the campground to ourselves and spread out. There was some traffic noise from the highway, but it quickly diminished after dark. I woke up at 6:30 and listened to the birds. I also took another stroll down the short boardwalk at water's edge. It's a pretty boardwalk, fitted around a number of cypress trees, including at the far end one that's about two feet in diameter. It's marred only by the fact that some of the supports are nailed to those same trees. The others rolled out of bed after 8:00 (times are EDT even though we were now in the CDT zone -- I didn't bother changing my watch). We all nibbled a bit and rolled toward Blountstown for lunch. I took the most direct route, leaving the scenic route for those with more energy and heat tolerance. The local food joints in Blountstown were closed on Sunday morning, and we ended up eating at Burger King. Here we split. I was sick of the heat, plus that rest of the route I'd ridden before, half of it many times. Jim had a long drive to get home and important work the next day. So Jim and I said goodbye to Leigh, Patsy and Nick and headed across the bridge to Bristol. End, about 150 miles in 2-1/2 days. Plusses: lots of wildflowers. Great company. Good camping. Almost no mosquitoes or any other bugs. I came back a good bit stronger. Most of the roads were excellent for riding -- smooth with a ridable shoulder any time traffic was an issue. Minuses: the heat. I wasn't really in adequate shape. The heat. Some of the roads were BORING. The heat. What I learned: I wasn't ready for this trip physically; if I were to get in shape on a loaded tour, I should start at about 40-50 miles/day, less in weather this stressful. It really is likely to be too hot in Florida in May, though the temperatures dropped from the mid-nineties to the mid-eighties a couple of days later. For me, that 10F cooler might have been bearable, though 20F cooler would have been a lot better, and 30F cooler ideal. You would think I would know that May would be this hot -- it's been that way for the entire 54 years I've lived in Florida. Some people are just too stubborn for their own good. The BOB Yak trailer rode very well -- I hardly noticed it while riding. However, it's difficult to get into the dry bag while it's on the Yak, and I had to adjust my packing so that everything I expected to want during the day was in my seat-back bag. Having the trailer does make it too easy to give in to the temptation to pack the kitchen sink -- though in fact I used most of what I packed (including the extra three liters of water), and most of the rest was emergency stuff that I would not leave behind. In this weather, the icing on Luna bars melts, and Power Bars get *real* soft. If I were doing it over I would pack just granola bars for spare food.